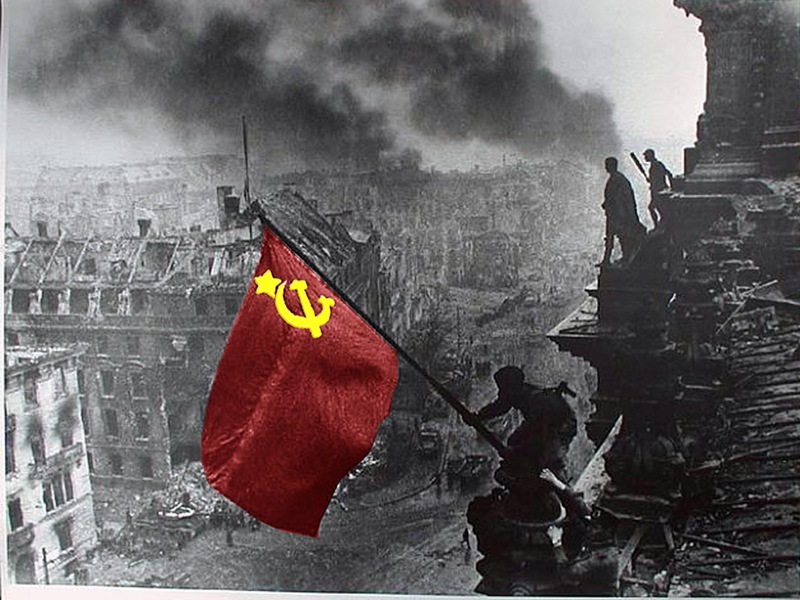 Soldiers of the Red Army, led by the CPSU(B), and Joseph Stalin, forced the Nazi Fascists out of their socialist motherland, and fought them all the way back to Berlin, finally capturing their capital and raising the red flag over the Reichstag on May 9 1945, while Adolf Hitler committed suicide in his bunker. 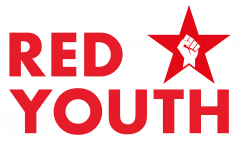 Some 27 Million Soviet citizens, and soldiers of the Red Armies gave their lives to vanquish Nazism, to show the ability of working people to abolish exploitation, and smash the Fascist doctrine of superior and inferior peoples and races. 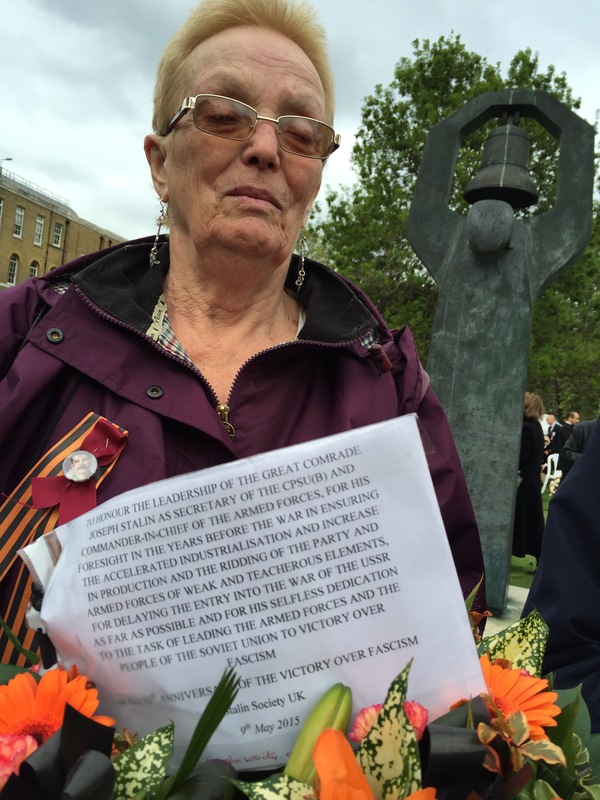 This year marks the 70th anniversary of the victory of the Red Army over German Fascism (9 May 1945 – 2015) (Lalkar). It was celebrated throughout Europe as marking the end of the Second World War, and is remembered in Britain as ‘Victory in Europe’ or VE day. 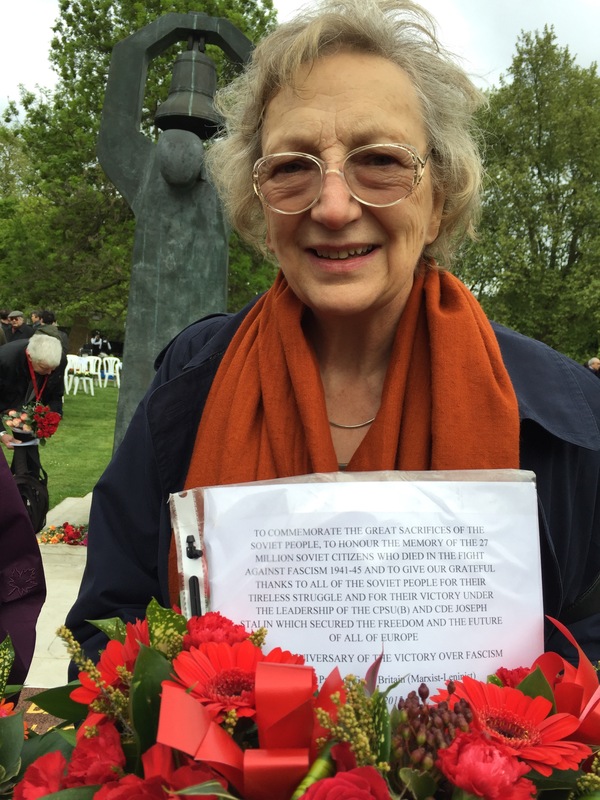 Comrades met at the Soviet memorial, pictured below, together with representatives of the Russian and British Governments, and other organisations. 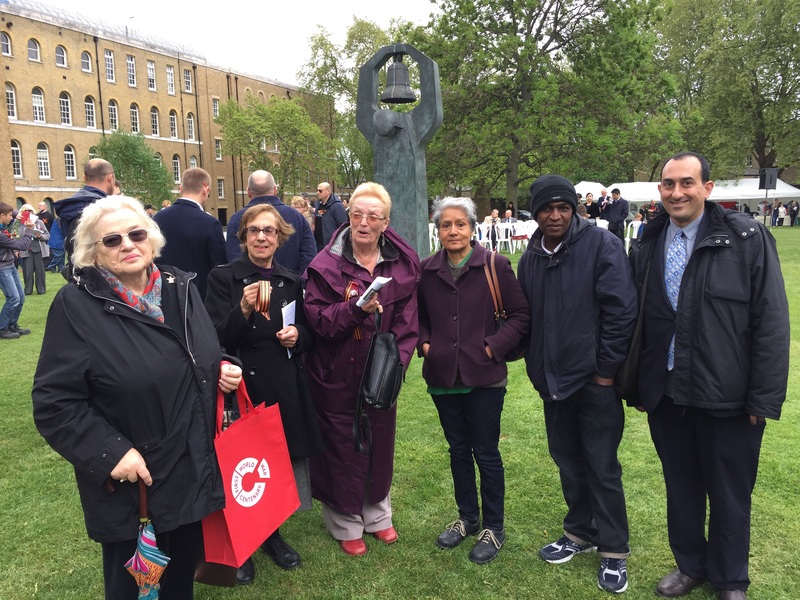 The memorial is situated in a small park in the grounds of the Imperial war museum in Kennington. (Geraldine Mary Harmsworth Park, Lambeth Road, London SE1 1HZ). Both are well worth a visit, if you have not been. We could not help reflecting upon the stark contrast between the debasing wars of conquest and plunder recorded and documented at this museum, (pursued by our imperialist ruling class in the interests of amassing their vast wealth and power, and by means of most foul murder, slavery and genocide,) and the heroic sacrifices made by workers and peasants, the common working people of the Soviet Motherland, to defend their right to end poverty and exploitation of man by man and nation by nation. This victory of Soviet Socialism, over the most aggressive and reactionary (Fascist) capitalist imperialism, is a world-historic event, that demonstrates to all humanity, that the future of capitalism is in the past, and shows what working people are capable of achieving once united in struggle for a bright socialist future. Our comrades came armed with revolutionary understanding and knowledge, and had excellent pamphlets for the crowd who had assembled to mark the occasion. 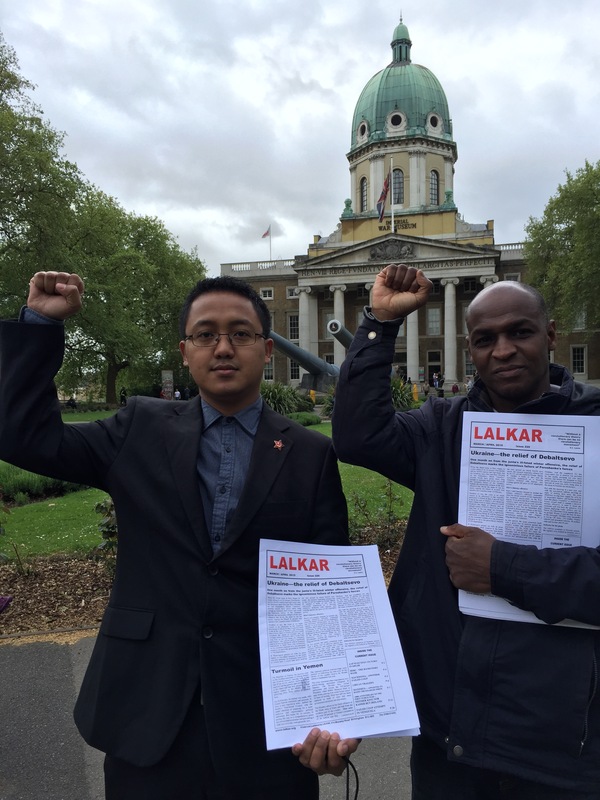 As well as our excellent pamphlet on the history of WW2, ’60th Anniversary of the Victory over Fascism’, comrades sold copies of Lalkar, which includes an article based upon a recent speech by Cde Harpal on the 70th Anniversary to the Communist party of Czechoslovakia & Bohemia in Prague. 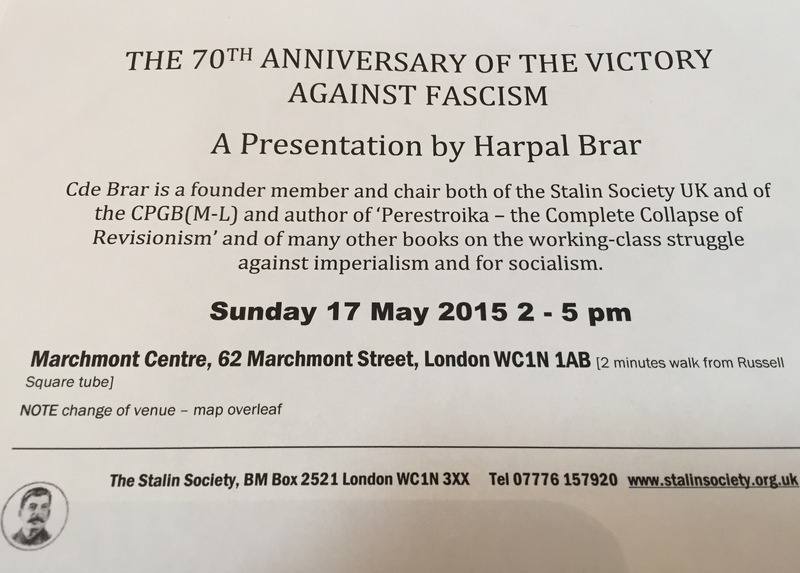 Cde Harpal is giving a presentation on 70th Anniversary to StS meeting 2-5pm Sun 17 May at Marchmont Community Centre, 62 Marchmont Street, London WC1N 1AB. Doors open 1.30 pm. Come if you’re in or near London! When people talk of heroic sacrifice of WW2, it was the united people’s of the multinational socialist state of the Soviet Union, under the leadership of the Bolshevik Communist Party, that made the supreme contribution to the fight. We must understand the significance of these achievements of socialism, and how imperialism was on the back foot while the Soviet Union stood to defend the rights of all workers and oppressed nations. Yet since the war, British and U.S. Imperialism have picked up the Hitlerite mantle of national oppression and exploitation, as their interference in the Ukraine (Lalkar) – which is just the latest example – in support of an illegal and openly fascist regime, demonstrates all too clearly. We are living in the era of Proletarian revolution. And although our path has been winding, yet we can say that no movement has made more historic progress, has more relevance, or a brighter future than communism. Previous Previous post: Celebrate Soviet Victory over Fascism!